In honor of Movember (formerly known as November), the Spare Room at the Hollywood Roosevelt Hotel is hosting a benefit tonight. The Movember movement raises money for prostate cancer research through guys growing mustaches for the month. For the rest of this month, the Spare Room will be featuring a mo-cocktail with the proceeds going to the Movember Foundation. 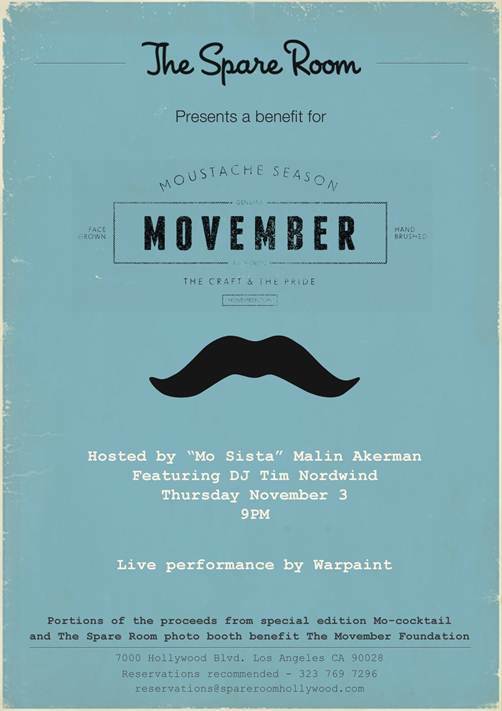 The festivities kick off tonight with the benefit event featuring music from Warpaint, Tim Nordwind of OK GO DJing and actress Malin Akerman hosting. So rock your stache and get to the Spare Room tonight. Be among the first to try the mo-cocktail. Channel your inner Tom Selleck; it's for a good cause.